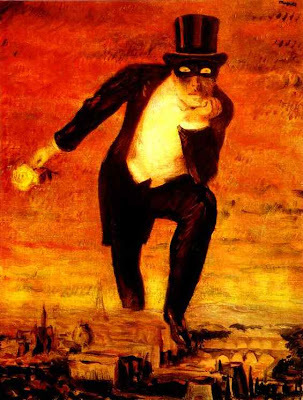 A jocular story was told about the Belgian painter René Magritte: He went into the grocer’s shop intent on buying a few slices of the traditional Dutch cheese; when the saleswoman moved on to grab the block on cheese on the display to cut the slices for him, he objected. What is the problem? Asked the saleswoman. Magritte responded that that block of cheese had been stared at the whole day. This anecdote sums up succinctly the impetus of the eye in Magritte’s paintings: Objects transform into other objects merely by seeing them. He aimed not at an eye of knowledge or interpretation but at a Cyclopean eye – once confidence is lost in optical illusions, all what remains is a fleeting moment of anguish in which the impossible dissolves into the possible. The temptation of the impossible is not realized in the absent subject of abstract painting in which only the vague voice of consciousness blends in with the brush of the painter – as for example in the paralyzing color-fields of Mark Rothko – but in visualizing wholly visible and real objects as impossibilities. The painter roughly classified as a surrealist – perhaps because of a period convention and association with prominent names of the movement – defies the illusion of the surrealists in positing that what interests him is not the world of dreams, for two reasons: Firstly, dreams have a time-movement quality that is only available to films; secondly, for Magritte the dream in painting is trivial and unimportant if it is not fully tangible. What Magritte wanted in his paintings was not to translate dreams, but rather to present a world in which rather than sleepwalking through images and representations, one stands before primal objects, at an interlude in which interpretation is not possible. Full wakefulness without reference to dreams as if in a procedure similar to that of Joyce’s Finnegans Wake: “Through all these scenes glide similitudes that no reference points can situate. Translations with neither point of departure nor support.” What does it mean to be awake? That seems to have been the real question that haunted Magritte. It is not persons or landscapes what he wanted to see but objects as they appear to us without standards or possible interpretations of reality. Paul Cézanne comes to mind when he says: “Well, no one has ever painted the landscape, man absent but entirely within the landscape”. Is it perhaps a re-configuration of both the still-life since its appearance in the Dutch paintings of the 16th century and of the pictorial space of the Italian 15th century? “The lived object is not rediscovered or constructed on the basis of the data of the senses; rather, it presents itself to us from the start as the center from which the data radiate.” Magritte’s interest was not in objects as compositions but in doing what his predecessor Manet would do – and whom he deconstructed in his own work – not in inventing non-representative painting but rather picture objects or painting objects. Ellen Handler Spitz. Museums of the Mind: Magritte’s Labyrinth and Other Essays in the Arts (New Haven: CT, Yale University Press, 1994): 48-49. Michel Foucault. This Is Not a Pipe (Berkeley: CA, University of California Press, 2008): 52. Maurice Merleau-Ponty. “Cézanne’s Doubt” in The Merleau-Ponty Reader: Northwestern University Studies in Phenomenology and Existential Philosophy(Evanston: IL, Northwestern University Press, 2007): 75. Michel Foucault. Manet and the Object of Painting (London, Tate Publishing, 2012): 79. Sarah Kofman. “The Melancholy of Art” in Selected Writings (Stanford: CA, Stanford University Press, 2007): 210-211. Hélène Cixous. “The Last Painting or the Portrait of God” in The Continental Aesthetics Reader (London: Routledge, 2000): 591-592.